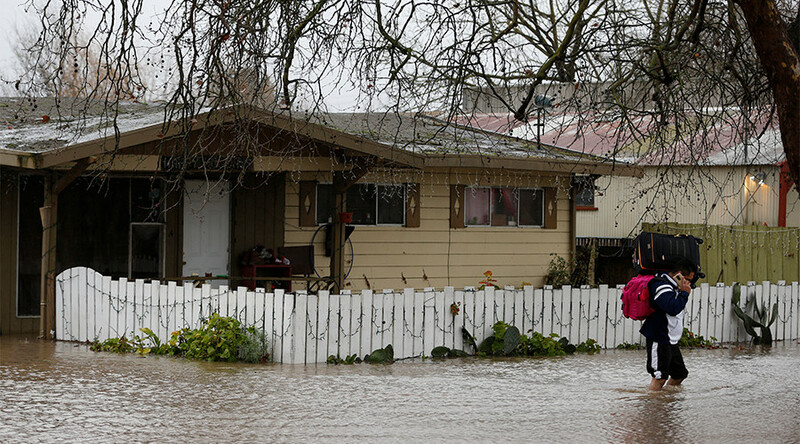 California has been hit by seven days of major rain storms, causing flooding all over the state and prompting evacuations. More heavy rain is forecasted for the Golden State in the coming days. After six years of drought, parts of California have received record amounts of rain, causing rivers to flood, roads to close, trees to fall, power to go out and businesses to shut down. The National Weather Service (NWS) issued several warnings across the state, and authorities have advised thousands of Californians to evacuate their homes after rivers overflowed. Just outside of the state capital, the Sacramento County Sheriff's Department advised 2,000 residents of Wilton to leave their homes. In Sonoma County, 3,000 residents were placed under an evacuation advisory as the Russian River flooded by more than 35 feet on Monday. The Russian River is predicted to reach its peak of 37.8 feet, more than 6 feet above flood level, according to the NWS. "It's just a lot of water," Kevin O'Neill, emergency services manager for San Benito County, told KTAR. "Fields that look like lakes. The ground just can't soak it up. Vehicles that are partly submerged, homes have water damage." In Guerneville, the river gushed into residential areas, where residents used canoes to help their neighbors evacuate their homes, which were submerged under several feet of water. The storm also destroyed an iconic California landmark, the Pioneer Cabin tree, a thousand-year-old Sequoia that was hollowed to let people pass through its massive trunk. Along with the rain, northern California was hit with record snowfall at the Mammoth Mountain Ski Area in central California, which reported 15 new feet of snow in the past six days. “The resort is approaching their all-time snowiest January on record,” ABC News senior meteorologist Max Golembo said. Storms are expected to move west on Wednesday, bringing more rain to southern California and other areas in the Midwest. "A series of Pacific storm systems will continue to impact the western U.S. with heavy rain and snow through the next couple days." meteorologists from the NWS Weather Prediction Center said. Some of the flooding in the farmlands of Sacramento/Roseville. The storms have helped California out of a severe drought, filling the state’s dwindling reservoirs to record levels. Precipitation filled the reservoirs with 423 billion gallons of water, or enough to serve more than 2.5 million families for a year, Maury Roos, a longtime state hydrologist, told the Los Angeles Times.